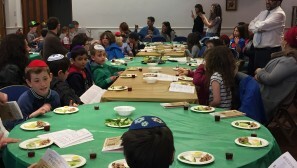 The Rabbi led a boisterous and energetic Seder taster which which was fun as well as educational. 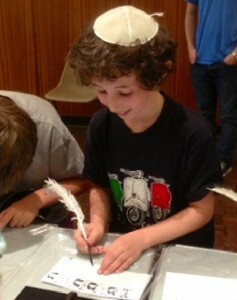 The rabbi’s theme was the Seder night as theatre as we went on a magical journey out of slavery in Egypt. 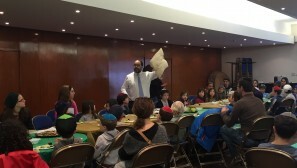 His props included a pillow (for comfort), a tray on his head, to remind us of how our ancestors had to take all their goods with them and, of course, matzo. 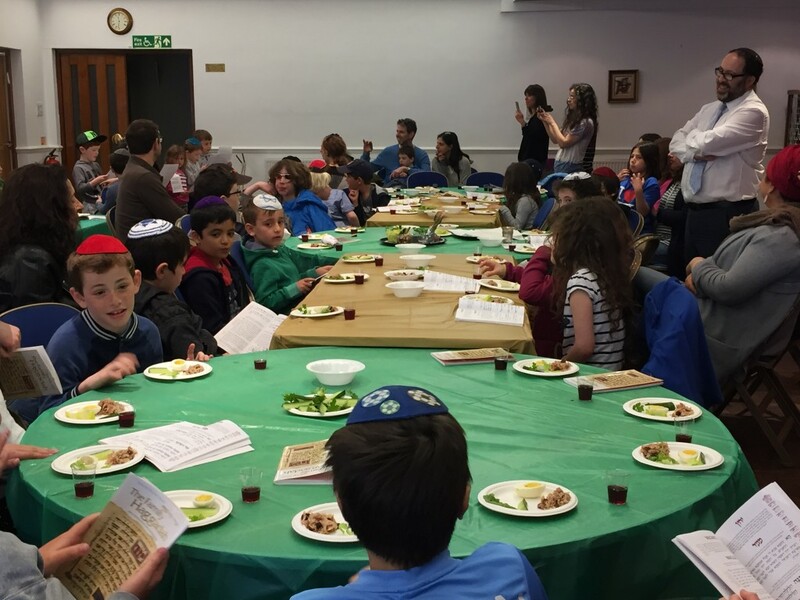 This Sunday we had the privilege of having Jewish Children International, ‘Tzivot Hashem’ providing enjoyable sessions for all the Cheder year groups. 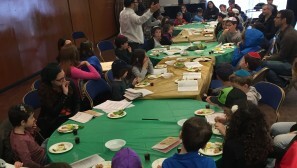 The hourly sessions included a great deal of practical information about Jewish scripture and its laws. This involved a hands-on demonstration where the children were allowed to handle real Torah scrolls and pairs of tefillin. At the end of the session all the classes participated in a fun calligraphy activity, where everyone got to use feathered quills and write Hebrew words with real ink on their own personal sheets. 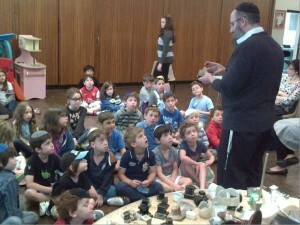 The whole Cheder really enjoyed themselves with a lot of the teachers getting involved in the activities. It was really impressive how so much information was learnt in such a short space of time. The annual Purim cheder event took place this week and was a tremendous success. 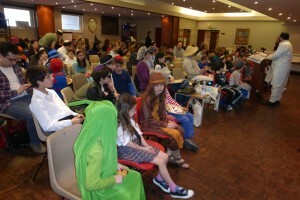 All the children came dressed up in some fun and eye-catching costumes. The splendid, entertaining megillah reading by the Rabbi was well admired, with everyone participating accordingly. Thank you to all of those who took part in the talent show! 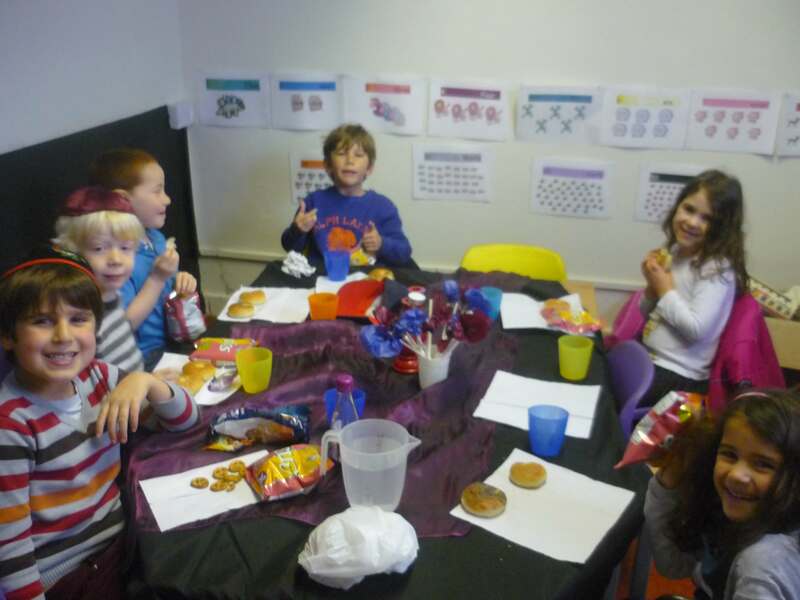 This week, Muswell Hill Cheder introduced it’s first ever reception class. All the children made the new reception class feel very welcome, and helped them integrate into their new surroundings. The reception children really enjoyed their first class; making a start to the ‘Aleph-Bet, and learning all about Tu B’shvat. 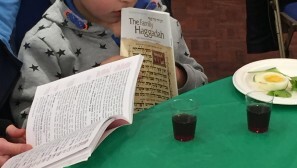 We hope the new class will be able to grow and gain from the cheder, so that their Sunday mornings should become a very enjoyable experience. This term we are excited to welcome our new Head, Samantha Hambling. Let me introduce myself as the new Head teacher of Muswell Hill Cheder. I am 48 years old, living in Ilford with my husband and three teenage children. Most recently I have been teaching Jewish Studies in King Solomon High School, although the majority of my teaching experience has been in various chedarim across London. Like many young people I started teaching at 16 years old in my local shul (Ilford Federation), whilst studying for A levels and then a degree. I then took a break at the age of 21, until I was asked to come back to take over the Bat Mitzvah class from the Rebbetzin who was leaving, about 15 years ago. I subsequently moved to Chingford and Highams Park cheder, staying there for 6 years. From there I enjoyed a short spell at Catford and Bromley cheder before being asked to join Chigwell and Hainault cheder, where I remained for 3 years. I have also prepared a number of girls for Bat Mitzvah, teaching them alongside their mothers, and taught a small group of teenagers for their GCSE in JS. I also occasionally give shiurim to a Ladies’ Group in Chigwell.